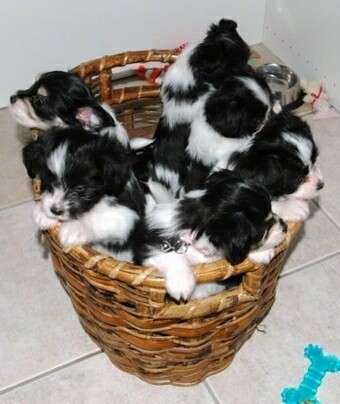 Basket of 6-week-old litter of Havallon puppies (Havanese / Papillon mix)—"We had planned a breeding only between Havanese, but my Papillon decided that he had to get in on in the action. We had thought they were Havanese as the day they were born would be too soon for them to have been sired by my Papillon. Well, he must've got a hold of her when we were unaware in the beginning. We sent out for DNA tests and everything. If we would've waited a couple more weeks we would've saved ourselves some money as the majority of the ears have started standing up!" The Havallon is not a purebred dog. It is a cross between the Havanese and the Papillon. The best way to determine the temperament of a mixed breed is to look up all breeds in the cross and know you can get any combination of any of the characteristics found in either breed. Not all of these designer hybrid dogs being bred are 50% purebred to 50% purebred. It is very common for breeders to breed multi-generation crosses. 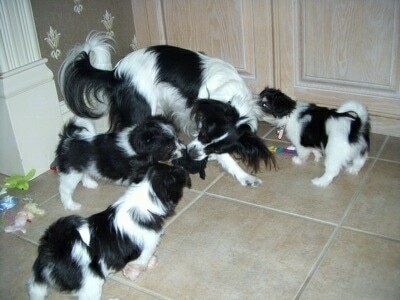 Havallon puppies (Havanese / Papillon hybrids) with their Papillon daddy—"These puppies are very intelligent! I taught one how to sit and she learned it in about 30 seconds. The others that I taught took a bit longer but it only took them one session to get it right! Very sweet puppies, they all are definite kissers!"